I've really learned to hate wifi! Sure it allows me to use the internet all over the house without running wires through the walls, but it has to be the most frustrating part of my computing infrastructure! Some days all works great everywhere, other days I can connect, but have terrible throughput. Wait an hour and things get either better or worse and I haven't moved! Read on for how even an ostensibly ProTechCoach suffers the vagaries of techno gremlins! I'm on my third D-Link Extreme Gaming Router and was quite happy with the first one, the second one was fine, but about 8 months ago I noticed it wasn't providing uploading as fast as I was paying Comcast for. Tested and found it wasn't Comcast, it was the router. Download speeds were fine, but the router would max upload at 2MB while the modem direct attached to a PC was properly allowing nearly 8MB (I pay for 7MB). No problem, I have a spare D-Link of one revision newer sitting on the shelf for such a situation. This is now D-Link #3. It installs fine, but neither of my Xboxes could see my Plex server, which had not been a problem before. Netflix and other streams started buffering where they never did before. Got bad enough I went down and swapped back to previous gimped, but functional router. All was then fine. Nuts! My spare router sitting on the shelf for a year was defective! OK, now throw into this my ongoing annoyances with wireless bridging and how unsatisfactory my experience has been with them. Perhaps the issue was tied into my not-quite-right routers, but if technology has moved along in the last couple years such that wifi power in one router can be enough to preclude my need for a wifi bridge, I want it! Less parts are always better than more parts in technology. 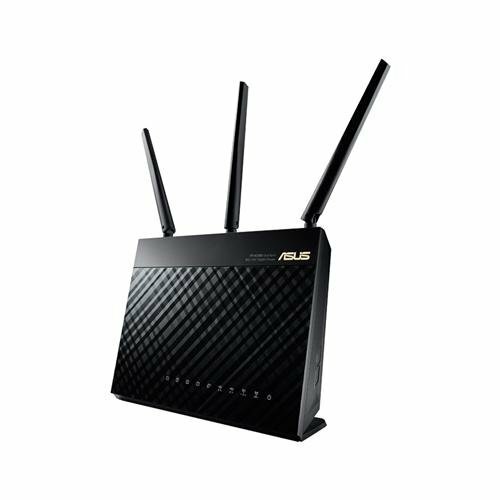 We discussed that Asus is not a traditional router name and I assured him that I believe Asus to be a solid company and would return the unit if they turned out to be router amateurs. He also indicated he liked a high end LinkSys unit for some feature or other, but it didn't have as strong a wifi signal. He had a similar report on his favorite high end NetGear router, but again, not as strong a wifi signal. Wifi signal power is what I wanted and that is what I stuck to. After having the unit up for only 13 hours, 16 minutes, all was great. I turned off the wifi repeater and was able to sit in the furthest corner of our bedroom, the worst spot in the house wifi-wise, and streamed Youtube videos to my tablet without problem. Xboxes and all devices automatically jumped on the router as I left SSID and other network settings the same. Best news was that I didn't know just how technologically behind my "extreme gaming" routers were. Content began loading on my phone and tablet at eye-popping speeds. Now fast forward a month or so. Unfortunately, the initial experience has not stayed quite true to hopes. The signal is just erratic enough in our bedroom that I ended up putting in a wireless repeater there. It is truly strange in that the signal seems fine on our Android devices 90% of the time, but only solid for my wife's iPad about 30% of the time. Given that her iPad is her #1 desired device in that part of the house, that just wasn't cutting it! I read a thread of reviews of people that have had this router for many months indicating they saw a degradation of signal power over time. One helpful engineer explained that cooling is likely a big factor here. Indeed I've noticed my routers over the years have been known to get quite hot. The engineer recommended putting routers in cool room (my basement qualifies) and even aiming a small fan at it. I'm going to do this as soon as I can acquire a small fan. I strongly suspect that my signal issues in the furthest reach of the house could be solved by moving the wifi router to the first floor, but that requires some punching of holes in walls and running of cable which I'm just not willing to do right now when easier fixes are proving satisfactory. Yeah, it "weren't cheap" and I'll really feel more comfortable recommending this unit in 6 months, but at this point it has fixed many of the problems I was having with the exception mentioned above. One thing I won't be doing is bargain shopping.